LTL Trucking shipments typically weigh between 100 and 30,000 lbs. Since it would be extremely expensive to continuously transport small amounts of freight, consolidating LTL Trucking shipments for transport is the more effective option. The main advantage of using Great Western Transportation for your LTL Trucking shipments is the network that we have in place to give you expedited transit times at very competitive pricing. 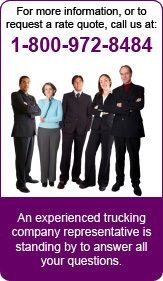 We have a number of services available not typically offered by other carriers. Great Western Transportation offers the following additional services: Lift gate services, sorting and segregating, de-vanning of containerized goods, palletizing and shrink wrapping, storage, distribution, re-delivery services, and warehousing. If your shipment does not fill-up an entire 48 or 53 foot trailer, we recommend LTL Trucking as an option. Our experienced staff will need to know the number of pieces/pallets and the weight of your commodities to determine if LTL Trucking is the best solution for you. Our Dry LTL Trucking, Refrigerated LTL Trucking and Flatbed LTL Trucking services extend throughout the Continental United States and Canada. Just give us a call or use our online quick quote system to let us show how we can assist you with LTL Trucking. Don’t Forget We Also Handle Full Truckload Shipments!